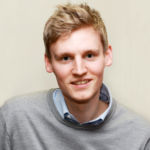 Home » Blog » Reports » How can we develop creative writing in schools? How can we develop creative writing in schools? 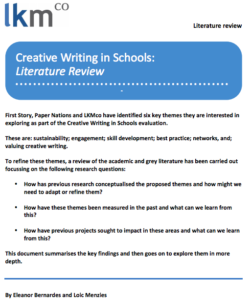 Today LKMco, First Story and Paper Nations publish a literature review showing how schools currently develop young people’s creative writing, and how the impact of creative writing interventions could be strengthened. The report finds that while successive governments have focused on raising standards in literacy this has been at the expense of cultivating excitement about writing, and suggests that arts projects can help reduce academic gaps between pupils from more and less affluent backgrounds. “Is a document that – while foregrounding some of the challenges (funding, getting whole school buy-in, pesky poetry) – is an extremely valuable ‘helicopter-shot’ of a huge range of material and established best practice. The bibliography then provides a reference point for important reading in this field, and I must now restrain myself from excessive book buying (as ever). Eleanor Bernardes and Loic Menzies wrote the literature review, which was commissioned by the creative writing charity First Story and Paper Nations network. It forms part of a larger, three-year collaboration between the organisations, exploring how the delivery and impact of creative writing projects can be enhanced. The work is being funded by Arts Council England. Schools can enhance the sustainability of creative writing projects by working collaboratively with other schools and partners, and by sharing ideas and even staff. So while there is no ‘silver bullet’ for success, and interventions need to be tailored to specific schools and their contexts, there are nonetheless steps schools can take to boost pupils’ creative writing. The report also finds that teachers’ widespread lack of confidence writing creatively in front of their pupils can hinder the effectiveness of creative writing interventions, and they find writing poetry a particular challenge. Share your thoughts on the literature and on creative writing in schools with us via Twitter.